Some years back in February, I took my wife up to Winnemucca and stayed overnight at the Winnemucca Inn so we could have dinner at “The Martin”, The Martin Hotel Basque restaurant. The trip was kind of a Valentine getaway. Now I know what you’re thinking, why in the world would anyone take their wife to Winnemucca for a Valentine’s Day getaway? The truth is, Winnemucca and The Martin have been a tradition in my family since the early 70’s when my dad, my brother and I were invited to come along deer hunting with some friends in the Pine Forrest mountains near Denio. When we took our first trip with our friends we were told by them, with much reverence, that the hunting trip would officially start with lunch at The Martin Hotel when we get to Winnemucca. I remember asking myself, “How in the world would going to a hotel be so revered”? Seeing “The Martin Hotel” when we pulled up in our pickups didn’t go far to ease my skepticism. When I walked into The Martin Hotel it was like stepping back in time. Cowboys and miners were standing and sitting at the bar along with some well-dressed men that seemed to be men of importance. We were welcomed as if we were old friends and asked if we were here for lunch. My dad’s friends replied “yes, but we would like to have a Picon’ Punch before we eat”. Because I wasn’t of age I had a Roy Rogers while everyone had their Picon’. As we sat at the bar two men at a table were playing dominoes and two other men were playing cribbage. When we finished our drinks we were escorted into the dining room and seated with other people, what I now know now as “family style”. The men and women that sat with us were two cowboys, a sheriff, a miner and some hunters. The friendly conversation that ensued was some of the best I have ever been privileged to have. I had never been at a restaurant that served family style or a fixed menu before. I can still remember my brother daring me to try the beef tongue and the look on his face when not only did I try it but I had seconds. Although my favorite that day was the lamb, I really enjoyed the salad, the tongue and the French fries as well. The Basque food and conversation that afternoon would spark a family tradition that is still enjoyed by my family to this day. 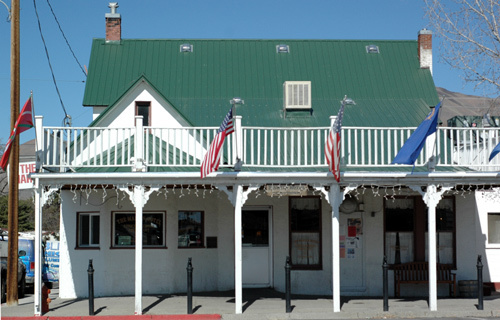 The Martin Hotel is located at 94 W Railroad Street in Winnemucca. The Martin Hotel was established in 1898 and is listed on the National Register of Historic Places. It’s dining rooms served heavy passenger and commercial traffic generated by the adjacent Southern Pacific Railroad. As a rooming-house it was once a favorite place for area cattle ranchers and sheep men to stay on their infrequent trips to town. 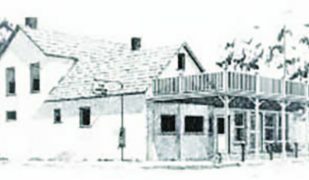 The Martin’s family style Basque dining room, bar and meeting rooms are still a favorite gathering place for area ranchers, townsfolk and travelers alike. It has a unique stucco exterior, familiar veranda and hitching posts. It’s interior is covered with an amazing variety of pressed tin walls and ceilings. 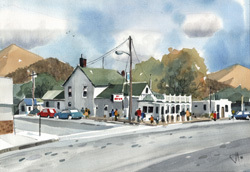 The Martin Hotel offers a truly wonderful setting to experience an authentic family style Basque American meal. After lunch we filled up our pick-ups and started the two-hour drive to Denio Junction. Yes, in those days it took about two hours. Although we had filled our gas tanks in Winnemucca, everyone was adamant about topping off our gas tanks before we left Denio Junction. Something that I highly recommend everyone do when they travel in this remote area; if the business is still in operation. We were all getting excited when we left Denio Junction on our way to getting to our final camping destination, Onion Reservoir. As we were traveling to our camp I was amazed by the diverse changing terrain and the amount of wildlife we saw. We traveled through flat plains of Sagebrush, crossed over Alder Creek, up steep hills into Mahogany groves and when we crested the last ridge over-looking Onion Reservoir we saw beautiful groves of Aspens all turning into fall colors. The view was simply breathtaking. Many years have gone by since that trip but amazingly the area hasn’t changed. The great thing about the Denio area is that there are so many things to do and so many places to go that it’s hard to decide what to do every day. Besides having some of the best fishing and hunting in Nevada, you can enjoy great hiking, bird and wildlife watching, photography and almost unlimited places to use your off-road terrain vehicles. When you’ve finished with your busy day you can submerge yourself and relax in Bog Hot Springs. Onion Reservoir is a beautiful lake at the base of the Blue Lakes Wilderness in the northwestern corner of the Pine Forest Mountains. Onion is a great lake to take kids or fishing beginners. It offers easy access and lots of fish. You can fish from shore or use a float tube, or a raft. Just a mile drive on a rough four-wheel road from Onion is a fairly easy uphill one-mile hike to Blue Lakes. Blue Lakes is three lakes nestled in a basin surrounded by Aspen, Pine and Fir trees. Without a doubt Blue Lakes is one of the most beautiful lakes I have ever seen anywhere. The fishing can be tough at times but at the same time you have a chance to catch many different species of trout. Six miles away from Onion reservoir is the best trophy trout fishery in Nevada; Knott Creek Reservoir. Knott Creek Reservoir gives the angler a chance to catch real trophy sized trout, but unlike Onion, Knott Creek is for the more experienced fly fisherman and must be fished most of the time by a float tube or small boat. The road to Knott Creek is not for the faint of heart. Some consider it to be an “E ride”. There are some very tough spots that require an experienced off-road driver and the road should never be attempted when it is raining. For those that are willing to drive a distance there are other fishing spots to try, such as Big Springs and Catnip reservoir. If you love to hike and view wildlife, the entire area has endless possibilities. On the basin floor you can see burros, wild horses, antelope, rabbits, hawks, Chukar and Golden Eagles. At higher elevations, you can view Mule deer, Big Horn Sheep, Mountain Lion, Chukar, Sage Hen, Hawks, Golden Eagles, Quail, Osprey and more. Seasonal wild flowers can be dramatic and the area is quite spectacular when the Aspen trees change color in the fall. A must-hike is to go into the Blue Lakes Wilderness area to see some of the most beautiful terrain ever, with a chance of spotting a Bighorn Sheep or Mountain Lion. For the hunter, the Denio area has always been a hot spot for Mule Deer, Pronghorn Antelope, Chukar, Sage Hen and rabbits. One luxury that is very popular with both men and women is Bog Hot Springs. Since there are no shower facilities in the area, the hot springs can be a blessing after a few days of rugged camping. Bog Hot Springs is the perfect place to soak your tired muscles after a day of hiking or fishing. My favorite time to go is at dusk and stay until after dark when the stars look to be so big and close that it seems as if you can touch them with your hand. Trailer and Motorhome access to Bog Hot Springs is easy and flat and you don’t need a four-wheel drive to get there. There are no campgrounds however. Improved camping facilities are non-existent. At Onion Reservoir, there are a few designated camps with fire rings, picnic tables and there is a BLM enclosed pit toilet. The Blue Lakes Trailhead has one picnic table and a BLM enclosed pit toilet also. For camping at Knott Creek Reservoir, I suggest tent or pick-up camping only. From Winnemucca, take 95 north from downtown Winnemucca for 33 miles, then turn left onto State Route 140. 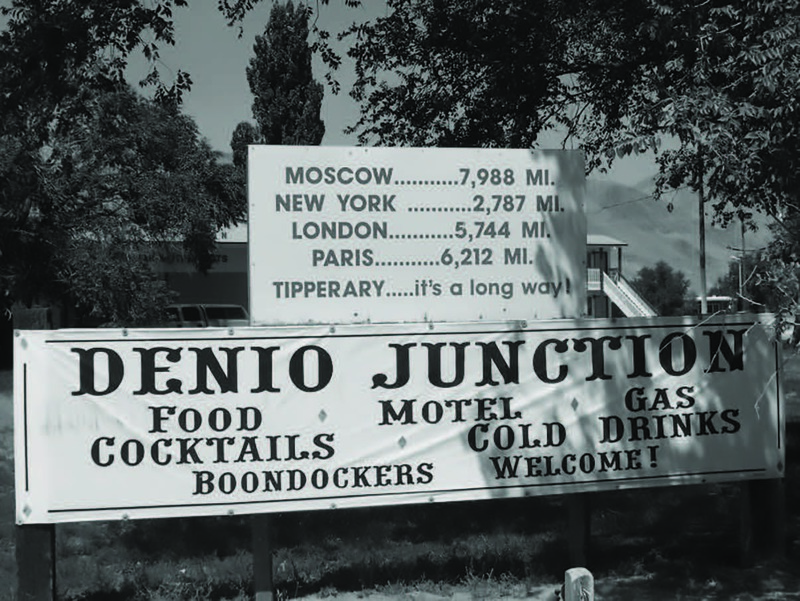 Travel 100 miles to Denio Junction and turn left on west State Route 140. Continue for 13 miles outside Denio Junction, look for the road sign that says, “Knott Creek Road.”. Make a left onto Knott Creek Road and travel another 7 miles. A dry lake bed on the right signals the turnoff is coming soon. Look for a BLM sign signaling a left turn to Onion Valley Reservoir and Knott Creek Reservoir. Travel 8 miles and you will see signs to both Knott Creek and Onion Reservoir. To visit Bog Hot Springs from Denio Junction you travel 9 miles west on Highway 140 and turn north off the paved highway onto a gravel road where you see the sign “Bog Hot”. The gravel road parallels the west side of the hills. You will travel on the gravel road 3.4 miles and notice Bog Ranch and pond. Keep driving about another 0.7 miles and watch on the left for a bare, chalky area. Turn here and drive a short distance until you notice water. Suggestions and warnings: Except for Bog Hot Springs all lakes and reservoirs will require a four-wheel drive vehicle. Take plenty of gas, diesel, water, food and a good map of the area. Cell phones do not work. Mountain Lions are plentiful and I suggest you carry pepper spray or a firearm. The Denio area is rugged, remote and not for everyone but for those that make the long and rugged trip will discover an unspoiled and diverse beauty that my family finds to be a kind of spiritual experience. You will not be satisfied by going just once.